This diagram shows the orbit of asteroid 2013 TV135 (in blue), which has just a 1-in-63,000 chance of impacting Earth. Its risk to Earth will likely be further downgraded as scientists continue their investigations. A recently discovered 1,300-foot-wide (400 meters) asteroid that passed near Earth last month could pay the planet another close visit in 2032. But, NASA officials say there is nothing to fear, as the odds that the space rock will hit Earth are extremely slim. 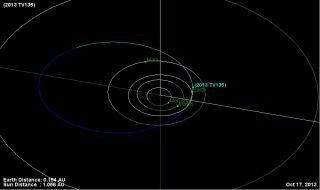 The asteroid (named 2013 TV135) was discovered on Oct. 8, by astronomers at the Crimean Astrophysical Observatory in Ukraine. Several weeks before it was spotted, however, the huge space rock flew within 4.2 million miles (6.7 million kilometers) of Earth on Sept. 16. "To put it another way, that puts the current probability of no impact in 2032 at about 99.998 percent," Don Yeomans, manager of the Near-Earth Object Program Office at the Jet Propulsion Laboratory in Pasadena, Calif., said in a statement. In the coming months, astronomers will continue to study 2013 TV135 in order to improve calculations of the space rock's orbit. Once more is understood about the asteroid, NASA scientists expect the risk of impact with Earth will be dramatically reduced, or even eliminated. "This is a relatively new discovery," Yeomans said. "With more observations, I fully expect we will be able to significantly reduce, or rule out entirely, any impact probability for the foreseeable future." Initial observations of 2013 TV135 indicate that it follows an orbit that takes it as close to the sun as Earth, before swinging out three-quarters of the distance to Jupiter's orbit. Astronomers who have been monitoring 2013 TV135 say it takes almost four years for the space rock to complete one full orbit. NASA's Near-Earth Object Program Office is tasked with finding, tracking and characterizing asteroids and comets that may pose a threat to the planet. Yeoman and his colleagues use telescopes on the ground and in space to plot the orbital positions of these objects over time. Since Oct. 14, a whopping total of 10,332 near-Earth objects have been newly discovered.